Stage 14: Saint-Paul-Trois-Châteaux – Mende. 187km. We’re expecting a summer holiday feeling for the first few miles of today’s stage, as we wend our way out of the medieval fortified town of Saint-Paul-Trois-Châteaux and roll through fields of lavender and sunflowers towards the winding roads of the Cevennes (hamlets, rivers, ravines and a noticeably slower pace of life). 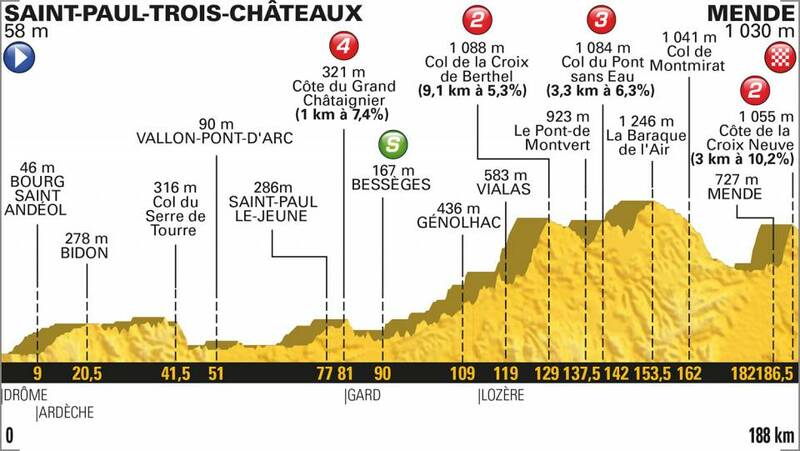 The afternoon will be more demanding as the route carries on into the foothills of the Massif Central and through the craggy gorges of the Ardèche river, towards the final leg-busting climb up to the aerodrôme above Mende, the sting in the tail of a stunner-stage. ← Stage 13: Bourg d’Oisans – Valence. 169km.